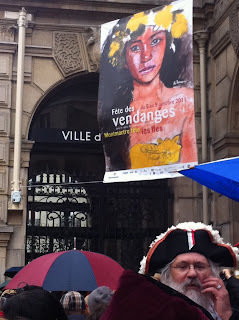 Despite an unfortunate change in weather from Indian Summer to Undeniably Autumn right before this year's Fête des Vendanges de Montmartre, attendance was high and the event lived up to it's reputation of festive, local fun in the true spirit of the 18th arrondissement. As a card-carrying member of the Jardins du Ruisseau I had the great pleasure of participating in the Grand Défilé on Saturday. 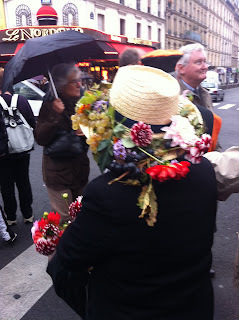 The parade wound its way through the streets of Montmartre on a grey but rain-free day. Bunkered by our friends, the Confrérie du Temps des Vendanges de la Porte Montmartre and plenty of drums and dancers, the Jardins du Ruisseau proudly represented our community garden and bee-keeping skills. Stacey and I busily buzzed around in our DIY bee costumes, experiencing the thrill of being in a parade for the first time in our lives. As an observer of the events surrounding the vendanges, I've always enjoyed viewing the parade and visiting the temporary village set up near the Sacre Coeur. The spirit of the event encapsulates everything I love about the 18th and Montmartre- it's sense of community, it's small-village feel, and it's unquenchable desire to party. 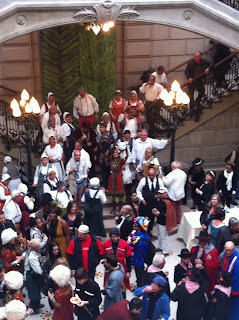 As a participant in this year's events, my sense of appreciation for the fête was even more heightened. 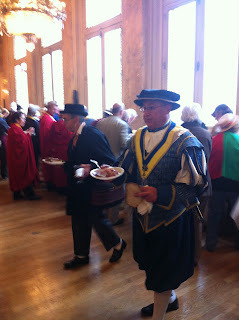 Gathering to lunch at the Mairie du 18ème before the parade kick-off, I was surrounded by the unequalled charms of France- the ridiculous regional outfits and headgear, the tendency to spontaneously erupt into song, and the comfort in knowing that there was wine available to all as far as the eye could see. 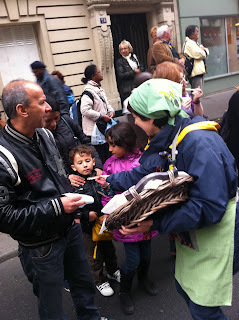 The scene turned from rowdy to family-fun as we assembled into parade formation, with baby bees from our confreries dancing to drumbeats and ambitous Moms passing out toast with home-made jams and honey to the little Montmartois both in the parade and on the sidelines. 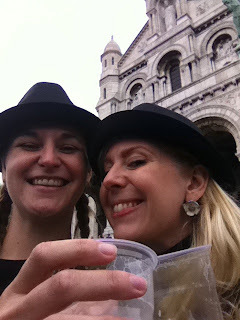 We finished our 2-hour pilgrimmage at the foot of Sacre Coeur and made our way to the top of the butte where refreshments awaited, including a selection of French artisinal and biodynamic beers and wine. A particular favorite was the artisinal beer from the Limousin region. The big joke of the Vendanges is the fact that the wine that is actually produced from the recolte of Montmartre's grapevines is incredibly overpriced and umm...maybe not the grandest cru of French wines. However, even if you've never tasted the nectar of Montmartre (an admission I owed up to on France 3) you can still celebrate the essence of the event: a coming together of people from near and far for the sole purpose of celebrating a season of local harvest, shared feasts, overflowing kegs and all-around community. The Vendanges de Montmartre is a yearly event that takes place over 4 days in early October. To get an idea of the various events, check out information from this year's event. If you are interested in becoming a member of the Jardins du Ruisseau, check out their Facebook page. Annual individual memberships are 12 euro and include access to the beautiful and convivial gardens as well as invites to tons of events and activities. Singing in the Marie after a buffet lunch and open bar. Wine Wizard carbo-loading before the big parade. These ladies never stopped dancing. Serious Vendange respect for them.